A history of the boom-and-bust cycles of the cattle industry in the wildest days of the Wild West. Knowlton has a sharp eye for details — in cattle towns, boardinghouses featured communal toothbrushes dangling from strings — but his real aim is the big picture. Cattle Kingdom is a cautionary tale of boom and bust. Despite the gunslingers and cowpokes, this lively history evokes the headiest days of the housing bubble of the early 2000s or the tulip mania that hypnotized Holland in the 1600s. The analysis does not bog down the storytelling. Knowlton deftly balances close-ups and bird’s-eye views. ...[a] lively and sweeping chronicle ... Mr. Knowlton writes well about all the usual fun stuff: trail drives, rambunctious cow towns, gunfights and range wars. What makes it a 'hidden history' is the way it enlists all these tropes in support of an intriguing thesis: that the romance of the Old West arose upon the swelling surface of a giant economic bubble ... I sometimes wished that Mr. Knowlton hadn’t felt the need to think quite so hard, especially since his book otherwise coasts along just fine on the strength of his curiosity and storytelling ease ... Mr. Knowlton resists the temptation to chastise the past about animal rights from our supposedly more enlightened century, but he steadily, sneakily reminds us that, even as the cattle bubble was bursting and the shareholders were being thrown into ruin, it was their four-footed commodity that did the real suffering. This is a fascinating tale, although Louis L'Amour fans should be forewarned: The focus here is not so much on Rowdy Yates as market rates. It's the OK Corral as a real estate play and High Noon as the deadline for closing escrow ... Nonetheless, Cattle Kingdom is a lucid and enterprising guide to a time, place and culture that most — at least those of us who got our education watching oaters — understand none too well ... Cattle Kingdom is the smartly told account of rampant capitalism making its home — however destructive and decidedly unromantic — on the range. Related this way, the story may not include many gunfights, but it offers ample conflict and drama delivered with a fresh and winning perspective. 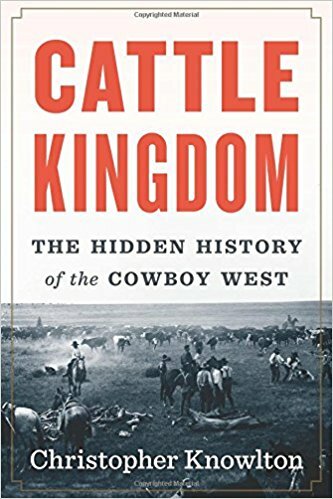 What did you think of Cattle Kingdom: The Hidden History of the Cowboy West?